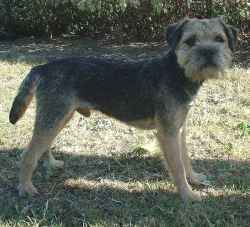 A Border Terrier is a small, rough-coated breed of dog in the terrier family. The breed was developed for fox hunting in the area around the border of England and Scotland. A family dog and country companion which is said to have no vice and is usually good with children; it will adapt to living in a town but is probably happiest living in a rural area.